220 Real Estate Marketing clients charge when the rest of the industry is in retreat! It's 2019 and the time is now to take your real estate business to the next level. 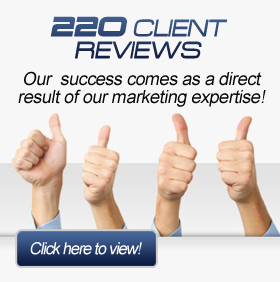 220 Marketing can help you achieve your professional goals even in a down market by offering support for all the aspects of a successful real estate business. We do this by training you to effectively use the latest web based technologies to increase your referrals from past clients and from referral partners. You will be driving more traffic to your site than ever before. 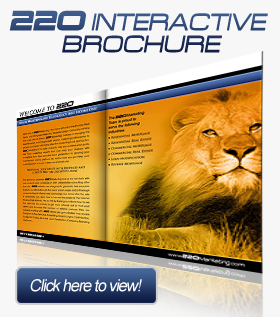 220 marketing experts will also teach you how to convert that traffic into more business. No more wasted clicks! Call us anytime to learn more - 877-220-6584. Don’t take our word for it. Look to the right of the page for a demo of one of our latest real estate website designs. We release new ones about every six months. Still not convinced? Not a problem. If you need a cutting-edge IDX solution we are proudly partnered with iHomeFinder. Just ask for more information when you call.